After the skin-stinging experience with aqueous cream (even before I found out that it had detergent in it) I decided to switch to something else. I wasn't really sure what to try but could remember being prescribed Dermol cream by the doctor previously so thought I'd try that again. I bought a really big bottle which cost me just over £10 from Boots. Optimistic? Dermol cream is much lighter than aqueous cream and rubs in much more easily. It does leave a slight greasy film on the surface of your skin but that didn't really bother me. When your skin is so dry a little bit of grease is more than welcome and it isn't greasy like ointment by any means. How did my skin react to it? The Dermol cream did not sting my skin like the aqueous cream did so at first I thought it was a great improvement. However I did not notice any improvements in my skin, if anything it seemed to get worse. Not realising this at first I kept using the Dermol cream more and more frequently to try and combat the sore red patches on my skin. I had it in my head that the more moisture I could force into my skin the better I could make my skin, without the need for steroid cream. But then as I was sitting researching types of dry skin cream and eczema cream on the internet when I read this review, about how the Dermol cream seemed fine to wash with but had brought up a reaction when used as a leave-on moisturiser. Then I had a moment of realisation and twigged that the more I had been using the Dermol cream the more the red patches had been spreading. They had got much worse on the sides of my face and had even spread to my eyes where I tried a little of the cream (which in hindsight I really shouldn't have done). Even all down my back where the eczema patches weren't so severe they had been steadily getting worse rather than better with the cream. I had ended up in a vicious cycle, slathering on the cream to alleviate the symptoms, which in turn only made the symptoms worse! After my realisation I jumped straight into the shower and washed off all the Dermol cream with very cold water. 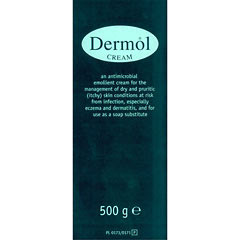 Dermol cream is fairly expensive, and although it rubs in easily and didn't sting, it was not good for my skin. Based on this I wouldn't recommend it but if your skin is less sensitive than mine you might be ok with it. My plan is to use the Dermol cream up in the shower as it can also be used a soap substitute, and use the aqueous cream as shaving cream for my legs. I think this will work better as the Dermol cream is runnier and more like shower gel, whereas the aqueous cream is thick and really sticks to your legs. NB I have since stopped using both aqueous cream and dermol cream even in the shower, and prefer to use coconut oil in the shower instead. I suffer from psoriasis and I have found dermal lotion/cream/emollient to be very good. It helps to keep my moisturised and does help with my psoriasis. Dermal can also be obtained via prescription in the UK. This product suits me. Don't be put off by review above as we all know there is always a percentage of people who medications or creams of any sorts do not suit. I had the same issue, until I used Dermol 500 instead. It's kind of thinner, so you don't get the greasy film, and because of how thin it is, it's also more 'breathable' so it didn't cause the usual rashes. I can even use Dermol 500 on my face, which is unheard of for me. The only other thing I can put on my face is special 50%water/50%wax emollient made on request by my chemist.